After many tries we finally got our Sunny/Bello litter. Sunny only had this one litter, with only two babies - we kept them both. Both babies inherited their mom's love for cuddling. 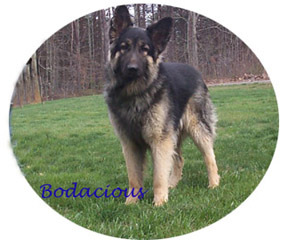 Bo is a mischief maker and enjoys playing tricks on his sister Dolly and the other dogs . He's always smiling and laughing. Dolly still likes to cuddle in my lap, not realizing how big she's gotten.